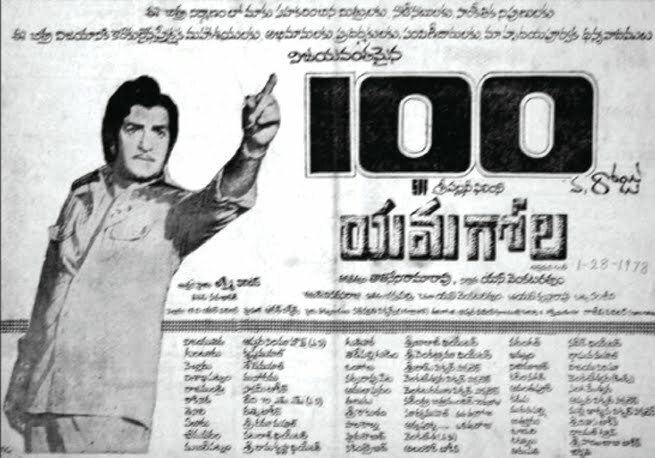 Trivia: This film had a 100-run in 29 centres and a 175-run in 6 centres - Vijayawada, Bhimavaram, Kakinada, Rajahmundry, Visakhapatnam and Hyderabad. This year (1977) NTR's three films - Danaveerasura Karna, Adavi Ramudu and Yamagola - were celebrated silver jubilee. It run 40 weeks in Hyderabad and Vijayawada. It run 100 days in late run at Srikakulam and Tanuku. Actually Venkata Ratnam, the producer, was planning this film with Sobhan Babu, who rejected after heard the script. Yamagola-the name itself fires our imaginations. And an extremely fertile imagination is what each and every Indian has, what with the diverse cultures and sub-cultures, history and mythology that we possess. Using Hindu mythology and sociology, can one conceive a movie idea? That's exactly what our Telugu movie veterans did, and we are talking way back-to the 1960s here. C. Pullaiah adapted a Bengali novel to make Devanthakudu, with NTR as the protagonist and SV Ranga Rao playing none other than the Hindu Lord of Death-Lord Yama. After this, many stories with Yama as one of the characters came about. Again in 1977, Yamagola was conceived. The script, story and even the title was passed to many hands, and finally it was S. Venkata Ratnam of Sri Pallavi Films who ventured to make the movie. After many changes and several discussions, the story was finalized. Satyam is a youth leader and a Panchayati Board President who stops the ex-President of the board, Rudrayya (Rao Gopala Rao) from executing his corrupt schemes. Satyam and Rudrayya's daughter, Savithri (Jayapradha) are in love and plan to get married. So Rudrayya gets Satyam killed, who immediately goes to heaven. He angers the King of Heaven, Indra, who sends him straight to hell. In hell, he influences the soldiers of death, Yama's army using communist theories and rights of labor, and turns them against their leader-Yama, and Hell shuts down. Yama sends him back to Earth, where Satyam changes his name and teaches Rudrayya a lesson. The base of this theme is derived from a Hollywood production called Death Takes a Holiday (1934). This socio-fantasy had to undergo many script changes to finally reach a shape and a structure worthy of NTR. But even Balakrishna, who just displayed his potential in Dana Veera Sura Karna as Abhimanyu was considered to play Satyam, but finally it was NTR who was finalized for the role. The dialogue 'Yamunda', used by Lord Yama, played by Kaikala Satyanarayana became famous and was used in many other movies later on. This was actually taken from the play 'Savithri' where the character of Yama uses this word on stage whenever he makes an entry. The shooting of Yamagola began on NTR's birthday-28th May, and was completed before the schedule ended! 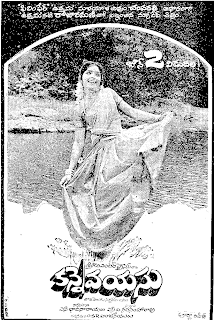 But the release was delayed because Adavi Ramudu was playing in full swing, and producer Venkata Ratnam wanted the very same theatres where Adavi Ramudu was playing for Yamagola. He had to wait for almost 4 months, but without regret-he readily agreed, and it was worth the wait. After Lava Kusa, Dana Veera Sura Karna and Adavi Ramudu, Yamgola joined in the league of Telugu movies which made a sum of 1 crore (and more, later on). One thing to be noted-all four of them starred NTR. After Adavi Ramudu, NTR and Jayapradha became a hit pair, and were repeated for Yamagola, with the audiences appreciating the duo immensely. To add to their chemistry, Chakravarthi's mass songs including 'Olammi Tikka Reginda' fuelled their success. Chakravarthi's musical career just took off after this movie, with SriSri's 'Samaraniki Nede Prarambham' becoming a huge success too. Allu Ramalingaiah as Chitragupta can be called a highlight to the movie. All his funny histrionics generated many laughs, as did Rao Gopala Rao as Rudrayya and TL Kantha Rao as Indra. All these factors were necessary to appeal to all kinds of audiences, from the front benchers to family audiences and children. So happy was the producer with the response to Yamagola that instead of handing out shields on the silver jubilee celebrations, as was the norm, he handed out gold ornaments. But in Hindi, where it was re-made with Jeetendra as Lok Parlok, the Hindi audiences could not tolerate the de-mystification of Yama, and the Lord of Death being teased by a mere mortal. Similarly in Tamil, in Yamanukku Yaman, Shivaji Ganeshan played the roles of both Satyam and Lord Yama-which was not digested by audiences either. So it flopped in both Hindi and Tamil. 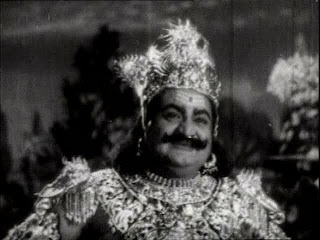 Yamagola worked with NTR's mass appeal, the well-written comic interludes and the acceptance of Telugu audiences of this unique socio-fantasy, and set many a trend in Telugu cinema.